I came across this picture tonight of a project I did for last Valentine’s day, and thought I’d throw it out there…it’s a versatile and easy little craft. 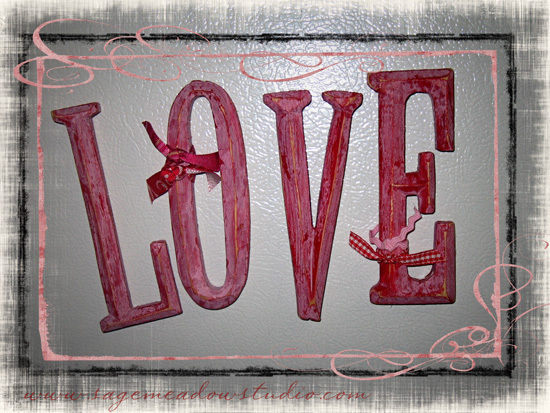 1-Slap some paint on the letters–whatever you want to use as the base coat…I used red here. Let it dry a little. 4-Hit the letters with a bit of sealer spray to set the look, let dry. 5-Tie bits of ribbon & trims around the letters wherever you please. 6-Cut strips off the magnet sheet to fit the back of the letters, hot glue them on. 7-Stick these babies wherever you like and SMILE–you accomplished something today! Nice! It looks rustic-y but isn’t complicated to create. Thanks! Found you through Tip Junkie. How cute, quick and easy! Love this! Thanks for sharing!